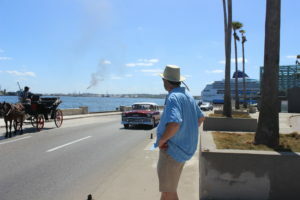 My husband and I recently took a cruise to Cuba with several other couples, and we spent two days in Havana. This visit was a strange mix of curiosity and perplexity about what life is like for a Cuban. 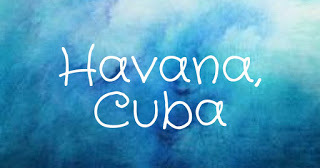 Havana is the capital and largest city of Cuba, which is the largest island in the Caribbean. It’s located 90 miles from Key West, Florida, and has a whopping 11 million residents. Many dance styles such as the Bolero, the Mambo, and the Cha Cha were created here. To visit Cuba, you cannot come as a tourist. There are 12 ways to enter the country—we came via the people-to-people educational branch, which required us to engage with the Cuban people in some type of meaningful exchange. (We did this by taking several tours.) We are required to keep documentation pertaining to this for five years. Watching the approach into Havana. Coming into port, we immediately noticed that only two ships can be docked at a time. The remaining berths were in decay. This would be a common theme as we made our way around Old Havana. 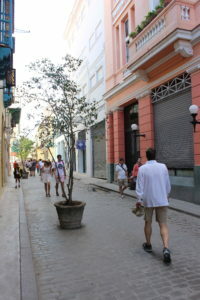 My husband on the streets of Old Havana. No shortage of rum in Cuba. Wall display at the rum shop. Our first tour was to a rum factory, except that it was closed, so we were instead ushered to two different gift shops. This didn’t really bother us—we’ve traveled before and are always willing to contribute to the local economy by purchasing souvenirs. But since my husband and I aren’t rum drinkers, we were more eager for the cigar factory tour. Here, dozens of workers hand-rolled the famous Cuban cigar, and it was fascinating. Employees may keep 5 cigars per day, and many of them sell these under the table. My husband was able to buy several that had just been rolled. When he smoked one a few hours later, he said it was the best cigar he’d ever had. Workers making cigars in Havana, Cuba. My husband enjoying his spoils. deli meats, swiss cheese, coleslaw, and Russian dressing. My husband with a cigar and a Cuban sandwich. didn't originate in Cuba, but rather in Florida. Cuba is a communist nation, and I won’t lie, it was hard to stomach at times because you can’t help but feel frustrated for what the Cuban people must put up with. Only ten television stations broadcast locally and satellite dishes are illegal. There is Internet, but it can only be used in city hotspots such as parks, and I wonder how throttled back it is. Families are only allowed to own one property, although in 2011 a law was passed that they could sell it and purchase another, but it could only be a cash deal. The government owns just about everything, and “I’ll pretend to work because you pretend to pay me” is very apt for many people. Schooling is free, medical care is free, but it’s only mandatory to attend school until 9th grade. University is free and it’s a matter of prestige to study law or medicine or engineering, but most people can’t make enough money in these professions, so we were told to not be surprised if a hotel bellboy is a doctor. 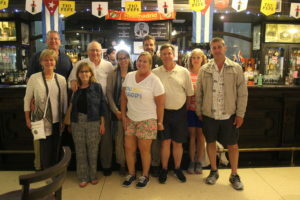 The tourist industry offers one way for an extra income, and the Cubans were happy to welcome us. and the Furious 8 film. The people are positive and vibrant, but they seem conflicted. The tour companies want to share the history of the Cuban people and try to redeem what Castro did (he dismantled the wealthy by giving away all of their property—Cuba claims to have zero homelessness). Coming from a democracy, many in our tour group actively argued with our guide, something I’ve never encountered in my travels. The ideals of Castro may have been sound in theory (the wealthy were corrupt and had to be taken down), but he appointed himself a dictator in the process. And the Cuban people have suffered for it. 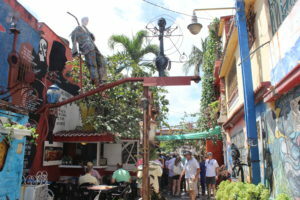 La Bodeguita del Medis in Havana. Here’s a very condensed history of Cuba. Cuba is considered a part of Latin America culture, deriving its customs from the aboriginal Taino and Ciboney peoples, the long period of Spanish colonialism, the introduction of African slaves, and a close relationship with the Soviet Union during the Cold War. The only cars that Cuban citizens can own legally are ones created and bought before 1959. Most are used as taxis. The United States acquired Cuba after the Spanish-American War via the Treaty of Paris of 1898, along with Puerto Rico, Guam, and the Philippines. Cuba gained independence from the U.S. in 1902. Under Cuba’s new constitution, the U.S. retained the right to intervene in Cuban affairs and to oversee its finances and foreign relations, as well as leasing the Guantánamo Bay naval base, which interestingly enough, Cuba considers to be illegal. While a succession of leaders led to political and social corruption, the country managed to prosper in the 1920s with a booming tourist industry supported by American-owned hotels and restaurants. But a collapse in the price of sugar led to a series of revolts and leadership changes, culminating with the dominance of Fulgencio Batista, a military sergeant who soon implemented an array of repressive policies. Despite this, by the late 1940s, a stable middle class had been created through an influx of investment capital. fed by locals and appear to be in good health. But in 1952 Batista once again came to power, and his policies widened the gap between the rich and the poor. He suspended the constitution, revoked many political liberties, and aligned himself with the rich sugar plantation owners. In retaliation to this flagrant corruption, Batista was forced into exile in 1958 by a man named Fidel Castro. 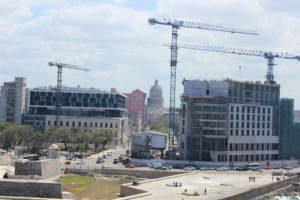 Initially, the U.S. supported this Castro Uprising (better known as the Cuban Revolution), but when Castro legalized the Communist Party and executed hundreds of Batista supporters, the relationship between the two countries deteriorated. He also took land from the rich, many of whom were American citizens. Between 1960 and 1964, the U.S. imposed a total ban on trade between the countries, so Castro signed a commercial agreement with the Soviets. When the Soviet Union collapsed in 1991, Cuba suffered a severe economic downturn. My husband waits to cross the street. Havana is a dichotomy of past and present. Our cruise ship can be seen in the background. In 2008, Fidel Castro resigned as President and his brother, Raúl, took over, promising to remove some of the restrictions on freedom for the Cuban people. In 2013, Cubans were allowed to leave the country and return as long as they had a passport and a national ID card (in 1961, if residents wanted to depart they needed an exit visa which was rarely granted). However, a passport costs the equivalent of five months’ salary, so only Cubans with paying relatives abroad can take advantage of this. Since the 1960s, the U.S. has imposed an embargo against Cuba, known as “el bloqueo” or “the blockade” among Cubans. It consists of economic sanctions against Cuba and restrictions on Cuban travel and commerce for all people and companies under U.S jurisdiction. In 2016, the Obama administration relaxed two of the restrictions, which allowed easier travel to Cuba and more commerce between the countries, but most other embargo restrictions have remained in effect. Proponents for the embargo argue that Cuba has not met conditions for removing it, which include transitioning to a democracy and improving human rights. Those against it say that it should be lifted because the failed policy is a Cold War relic and has clearly not achieved its goals. The sanctions are hurting the U.S. economy as well as Cuban citizens. On June 16, 2017, President Trump cancelled the Obama administration’s easing of travel and trade restrictions, enforcing the ban on tourism. Effective November 9, 2017, U.S. visitors to Cuba must travel with an organization rather than on their own, so one of the few ways to visit is by a sanctioned cruise itinerary. Would I recommend visiting Cuba? For a vacation, no. Old Havana is in disrepair and the food is average. There is also a confusing system of two currencies (the one we used—known locally as Kooks—was tied to the U.S. Dollar; the other one—used by the local population—is not; this is yet another way the government suppresses the population). But as an eye-opening experience to a culture sliding away while struggling to stay afloat on the world stage? Yes, it’s worth a look. As my husband says, “Cuba is for the traveler, not the tourist.” Maybe one day that will change, because there is so much potential here, and the people deserve better. And they do have some of the best cigars, rum, and coffee in the world.